Wonder how reel slots got that way? Find the answer in the text below. Once upon a time Charles Fey invented the first slot machine and thus, in fact, the history of slots has been laid. The First Machine was huge, awkward and mechanic. The payouts of this slot machine were smothered with number of reels and symbols machine possessed. Thereby the first slots had 3 reels with 10 symbols each (horseshoes, bells, hearts, diamonds and spades). Three bells in line provide player with jackpot and the game with its name as well (bell machine). With the course of time the number of symbols has increased and thus 3 slot reels achieved 20 symbols featuring 8 000 possible combinations (20x20x20). In addition the extra reels (4th and 5th) appeared but such innovations never took on and were not of success among the gamblers. 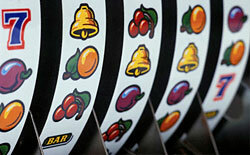 The 3-reels and the 5-reels slots are likely to be the generally accepted standards of slots gaming. 1984 was a crucial date when the random number generator was first introduced. That's how the virtual reel slots have really appeared. The RNG introduction influenced the payouts significantly. As the physical reel has only 22 symbols in general - the virtual reels possess 32 or up to 256 virtual stops for each reel. E.g. a machine with 5 reels and 50 symbols produces 312 million combinations approximately. Since you can't even imagine the amount of virtual stops - it's impossible to find out the odds for hitting jackpot and thus they are so huge in comparison with old ones. The slot machine cheats also cry bitterly as the new rules make the cheating practically impossible. Nowadays casinos just fix the stable percentage of paybacks for players. Thus if a casino has 80% paybacks that means, say, the one given machine inserted with $100 000 would return $80 000 for a player side and $20 000 stay for a house. The slots with bonus plays + extra rounds are open for a player to choose and experience. Generally speaking the reel slots are the precursor of modern slot machine activities and the basic principles of 3-reels metal box still form the background of current gameplay.